We offer clients a system of residential or commercial flooring removal that gets rid of the dust produced by these projects. With our industrial vacuum system, we eliminate the mess and hazard caused by dust residue created by traditional methods of tile removal. The result is a more efficient and healthy process that doesn’t impede your business activities or home life! Traditionally, homeowners have had to leave their residence during floor or tile removal due to the dust produced by the process. Even after every surface of the house is covered with plastic, homeowners would be plagued by a layers of dust residue covering their home for weeks after floor removal. With the DustBusters system, all of this hassle can be avoided. Our industrial vacuums eliminate dust from the source during the floor removal process, preventing it from getting into the air or anywhere inside the home. This allows homeowners to stay in their homes during the entire process and prevents dust from creating a health hazard or a mess. With DustBusters, there’s no mess, no dust, and no hassle- leaving you with a quick, efficient, and affordable floor removal that gets done within your timeframe and at your convenience! Renovating your business or commercial building can be a huge undertaking. Any lost time due to having to suspend daily activity means lost profits for you and your company, and that’s something to avoid as much as possible. A tile removal system that creates dust means possible interruptions to your business, having to close up shop, product damage, or health hazards to your staff. Fortunately, all of this is avoidable with DustBusters’ dust-free floor removal system. Our industrial vacuums mean that your building is protected from timely and costly clean-up efforts, that your staff is protected from environmental hazards, and that any renovations or construction being done at your place of business is quicker and more efficient. With experience in floor removal for restaurants, retail spaces, medical offices, and more, the team at DustBusters is equipped to handle any project you have for us efficiently, affordably, and professionally. At DustBusters, we have all had experience in the world of contracting. We know that it’s important to produce high-quality work while still remaining within your client’s budget and timeframe. 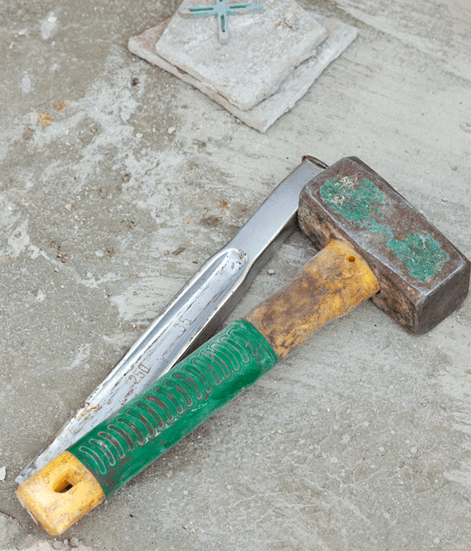 If you’re installing flooring for a client, having to clean up dust from the floor removal process can delay your own project, degrade the quality of your final work, and leave you with unhappy customers. With our dust-free tile and floor removal, we eliminate these hassles and provide contractors with a clean, smooth base for installation. 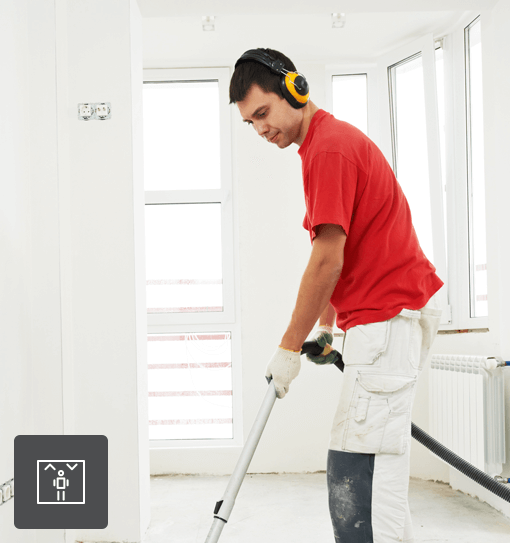 Having a dust-free floor removal process prior to beginning any contract work results in happy, satisfied customers, efficient and quick timelines, and higher-quality finished products. Work with us to increase callbacks and referrals for your contract services! 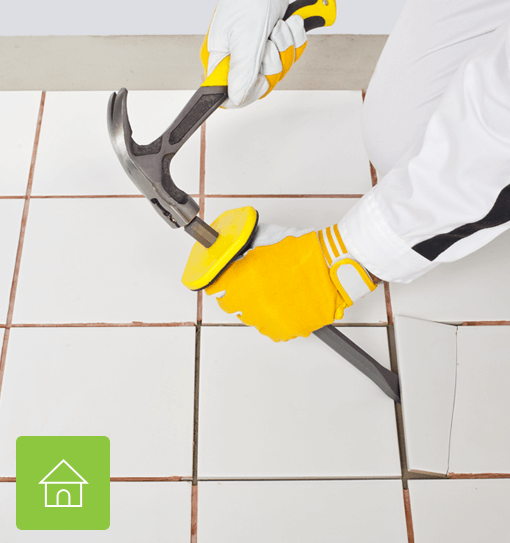 Your go-to team for dust-free, efficient, and affordable tile floor removal for your private home or business. No mess, no stress! At DustBusters, we have all had experience in the world of contracting. We know that it’s important to produce high-quality work while still remaining within your client’s budget and timeframe. 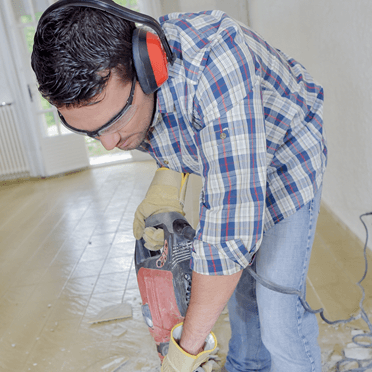 If you’re installing flooring for a client, having to clean up dust from the floor removal process can delay your own project, degrade the quality of your final work, and leave you with unhappy customers. With our dust-free tile and floor removal, we eliminate these hassles and provide contractors with a clean, smooth base for installation. Having a dust-free floor removal process prior to beginning any contract work results in happy, satisfied customers, efficient and quick timelines, and higher-quality finished products. Work with us to increase callbacks and referrals for your contract services!